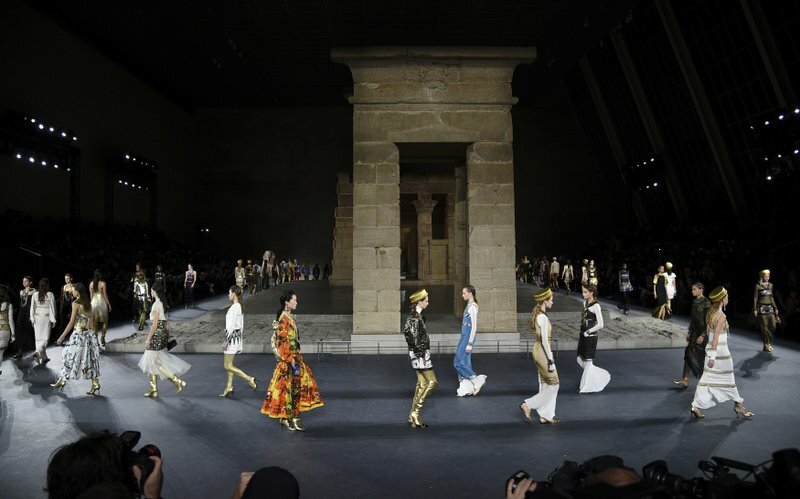 A shiny and glamorous version of ancient Egypt ruled the evening — with entertainment royalty on the runway, too — as Chanel brought its traveling fashion show to New York and the famed Temple of Dendur at the Metropolitan Museum of Art. Designer Karl Lagerfeld, a lover of lavish spectacles, chose the dramatic venue for his 17th annual "Metiers d'Art" show, which takes place in a different city each year and celebrates the craftsmanship of the artisans that partner with Chanel. The imposing temple, completed in about 10 B.C., is a highlight of the Met's collection and a favorite site of the museum's annual spring fashion gala. Indeed, the Chanel show felt like a mini-Met Gala with celebrity guests including actresses Penelope Cruz, Julianne Moore, Margot Robbie, Marion Cotillard and Lily-Rose Depp, comedian Jerry Seinfeld, and director Sofia Coppola. One particularly stunning shoulderless gown looked like an Egyptian mosaic, with interlocking "tiles" in the Egyptian color palette of light and dark blues, red, and of course, gold. The handiwork involved in the garments was displayed in brief videos posted by Chanel on Instagram ahead of the show, from artisans' ateliers, or workshops: metalwork and jewelry-making from Goossens, pleating from Lognon, feather and flower adornments from Lemarie, embroidery from Montex, costume jewelry from Desrues, embroidery and tweed from Lesage, Massaro shoes, and golden Maison Michel hats. "I think we can use the word genius to describe Karl," said Cruz, in a navy gown she said was from the last "Metiers d'Art" collection. "He's very unique, and to spend time with him and see how much he knows about everything and how much curiosity he still has to keep growing and to keep learning ... he works so hard." As they left the museum, guests were escorted into black cars for a ride about 10 blocks south into Central Park, where an indoor venue had been transformed into a Chanel "diner," complete with food trucks dispensing drinks, cheeseburgers and fries, and milkshakes.